Stella Oduah, the former Minister of Aviation who became a subject of national discuss with her #OduahGate scandal, is currently enmeshed in a fresh crisis. The former minister, who is not new to embezzlement charges, has locked horns with the Economic and Financial Crimes Commission (EFCC) following the anti-graft agency’s decision to seize her passport a few days ago. Oduah’s passport was said to have been seized after she was quizzed by operatives of the EFCC for several hours. EFCC is gathered to have instituted another strong case against the ex-minister. 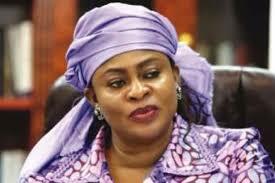 “Senator Stella Oduah returned for the second round of questioning on Wednesday. After intense grilling, she was allowed to go home on the condition that she turns in her passport to the EFCC. She was asked to return to the EFCC on a future date for more questioning,” a senior EFCC official was reportedly quoted. In 2013 human rights lawyer, Mr. Femi Falana (SAN) wrote a petition against Oduah for allegedly approving the purchase of two BMW vehicles worth N225m by the Nigerian Civil Aviation Authority in breach of the Public Procurement Act.